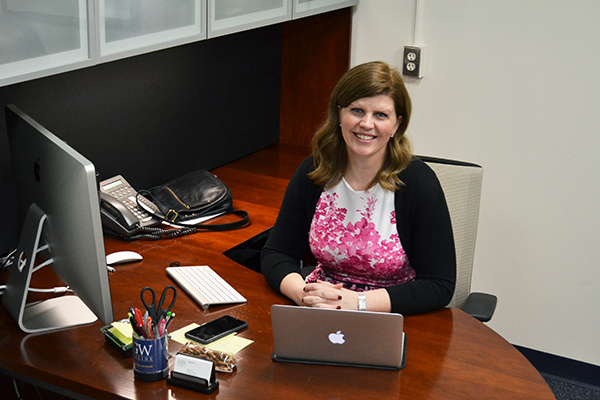 GW's in-house online course creation department wants to double the number of courses it creates each year to keep up with the demand, Director Camille Funk said. The University’s in-house online course creation department wants to double the number of courses they create each year to keep up with the growing demand for online courses, the director of the department said. The eDesign Shop, which launched last year, currently creates about 30 courses each year, but has seen a dramatic increase in demand for the creation of online courses. Camille Funk, the director of the shop, said the office is looking to churn out about 60 courses each year by adding two new employees to their team. Funk said the shop has been working on six programs this semester, including an online graduate certificate in LGBT health and a master’s of government contracts. But the demand to create programs is currently higher than the shop can handle. Funk said there are about 10 programs “in the wings” that departments at GW have requested from the shop. Some of the requests are to revamp programs that outside companies like Pearson Education have designed before the shop opened. GW’s online presence has increased since Paul Schiff Berman, the vice provost for online education and academic innovation, stepped into his position three years ago. Berman will leave the post to return as a full-time faculty member in the GW Law School in January. Berman said as the University’s online programs become more popular, having the eDesign Shop create the courses instead of outside companies could end up saving the University money. GW often pays outside vendors to create online courses by giving them a certain percentage of tuition revenue from the course. But because it’s in-house, the eDesign Shop doesn’t come at a cost to departments at GW. The University provides a budget to pay for the shop and pay the employees’ salaries, Berman said. “It is likely that if the program generates a substantial number of students, that it would be more cost effective to use the eDesign shop,” he said. He added that he’s asking departments to ask the eDesign Shop to design their online programs. But with that increase in requests, Berman said the shop needs to be expand at the same time. “The demand is already higher than what we can currently accommodate, and I expect that it is going to be an even greater problem moving forward,” he said. Funk said Berman submitted a budget for next fiscal year that would increase the number of programs that the eDesign Shop could create each year. Funk said with an influx in funding, the shop hopes to hire animators and a videographer to their team. Funk added that the shop designs courses for departments that both have and have not already brought their courses online in the past. Funk said the School of Business’ master’s of business administration degree had previously been created with Pearson Education, but as that contract expires, the school is looking to the eDesign Shop to rework the program and make it more cutting edge. “If we’re going to be able to make high-level quality, we have to have the resources to be able to do so,” she said. The shop has also had to limit their growth after 5 percent budget cuts that affected all administrative departments last year, she said. Funk said that because online learning has the potential to bring in tuition revenue, it might be a good option to grow the office. Funk said the temporary funding that Berman proposed to funnel into the shop could be key in keeping up with the demand to create new programs on campus. But she said the influx of money is a temporary solution, and can keep the shop running until officials find a more permanent solution for funding online course creation. She said Berman has been instrumental in expanding the shop.